When we first met Christabel Sendeya in February 2017, she was a nervous teenager, and was awkward around people. When she spoke, she couldn’t maintain eye contact, and struggled to construct a sentence in English. She grew in far-flung Lomut Village in West Pokot, which has limited access to basic learning resources. She had to trek long distances every day to get to school, which derailed her personal and academic progress. West Pokot is one of the 14 counties classified as marginalised and lags behind in almost all spheres of life. Female circumcision is still practiced in Sendeya’s community. “Once a girl has been circumcised, you are supposed to be married off and you don’t get an opportunity to go to school,” says Father Patrick. Sendeya is lucky she did not go through the outlawed practice. “Life in West Pokot can be punishing, especially for the girls,” says Father Patrick Murunga, a priest at a local church in the county. He is the one who told Sendeya’s mother about a scholarship opportunity at the M-PESA Foundation Academy. A lot has changed in Sendeya since we met her early in the year. She now has a confident gait, she sings with the Glee School Choir, has made friends from all over the country, and is ready to shatter the glass ceiling. This is all thank to the M-PESA Foundation Academy, which is giving more than 200 students a chance at getting good education. “The M-PESA Foundation Academy offers a world-class, well-rounded learning environment to develop the future leaders,” says Les Baille, the Academy’s CEO. The academy places great emphasis on the holistic development of all learners not just in academics but also in technology, music, sports, the arts and community service. So much so that it has caught the attention of Education Cabinet Secretary Fred Matiang’i, who says that the academy has created an exemplary model that can be used to review the national school curriculum. 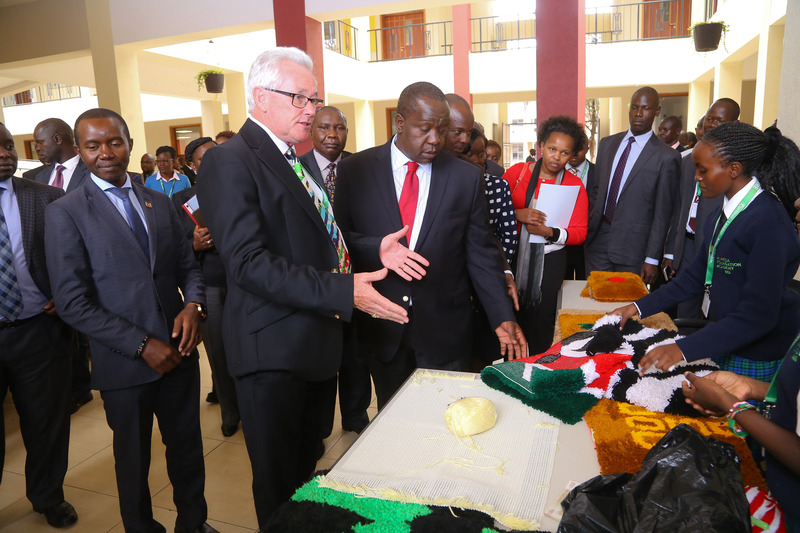 During a recent visit, Dr Matiang’i directed the Kenya Institute of Curriculum Development to borrow lessons that can be replicated in public schools. “I have been to your classrooms and I’m so impressed by the fact that you express yourselves so intelligibly and so confidently, which is the desire of all of us; that our education system should produce confident, happy young people who are going to grow up and take over the management and leadership of this country,” Dr Matiang’i told students at the school in July. M-PESA Foundation Academy CEO Les Baillie with Education Cabinet Secretary Fred Matiang’i and his ICT counterpart Joe Mucheru at the Academy in July. “I came with the directors from the Kenya Curriculum of Development so that they can make sure that when we change the curriculum, we will end us with a system similar to this,” said the CS, who was accompanied by his ICT counterpart Joe Mucheru. Mr Mucheru is a founding member of the M-PESA Foundation Academy board. Dr Matiang’i paid tribute to Safaricom CEO Bob Collymore and the M-PESA Foundation for the initiative that takes brilliant children from challenging backgrounds and gives them a world-class education. Mr Baillie said that all the fees and other amenities are catered for by the M-PESA Foundation. The Academy is in its second year. The first class, now in Form Two, consists of two students from each county while the Form One class consists of four students from each county. According to Mr Baillie, the school hopes that by the time the students graduate, they will be ready to join some world’s leading institutions of higher learning and also be ready to become leaders in the fields they pursue. “We are already in discussion to have those who wish to proceed with university gain full sponsorship in some US universities. We are also planning on creating a fund for students who wish to start businesses to access starting capital,” said Mr Baillie. Mr Collymore said that the Shs4 billion investment is in line with the Safaricom’s purpose of transforming lives. 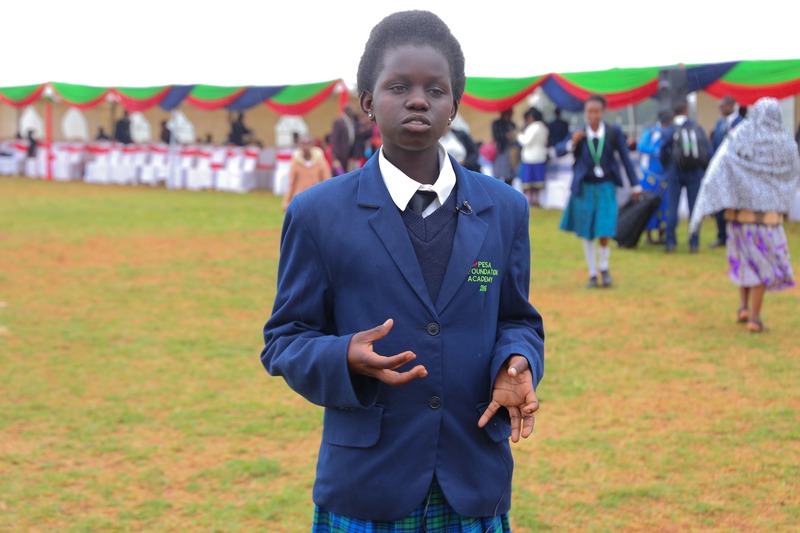 This transformation is already evident in students like Sendeya.